I spent the last week in Seattle. And, I’m fairly certain I fell in love. I want to live there someday. It’s absolutely beautiful. I’d never been to Seattle before, but it had always been a place I wanted to visit. Partly because I Love (yes, with a capital L) the rain. I’m a huge fan of cloudy days, cold weather, and jumping around in rain puddles (with rain boots on, of course). The other part, which you may have already guessed, is that Seattle is the birthplace of Starbucks. And, we all know, how much I love my coffee. I spent most of my time walking the streets in downtown Seattle. Window shopping with my mom. Drinking excessive amounts of coffee. Site seeing with my family. Jumping around in the fall leaves (don’t judge me…we don’t quite get all, or really any, of the fall changes in California. In fact, it’s still in the eighties where I live.). Watching the Seahawks’ fans proudly wear bright green and blue. And, eating more than my fair share of desserts. There was one bakery, in particular, that I would gladly live in. It’s called Cupcake Royale, and it may just be the cutest little bakery I’ve ever seen. They have coffee, homemade ice cream, and adorably decorated cupcakes. Can you see why I want to live there? They had Pumpkin Cardamom ice cream, which I obviously had to try, and I can’t even begin to explain how good it was. It had chunks of soft pumpkin bread swirled with a cardamom cream cheese ice cream that was literally like eating pumpkin pie in ice cream form. Just thinking about it makes my mouth water. 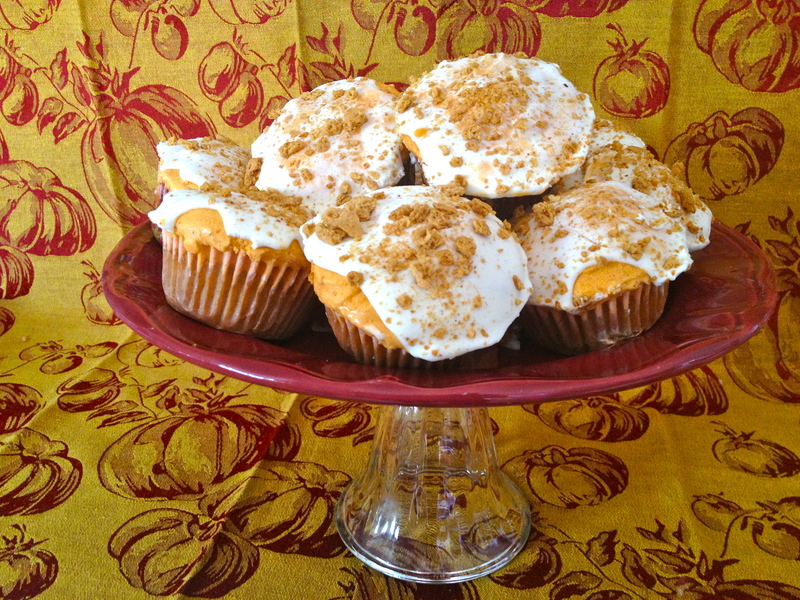 That ice cream was the inspiration for these Pumpkin Ice Cream Cupcakes. And can I just say, these little bad boys taste pretty darn good. These Pumpkin Ice Cream Cupcakes require a little bit more time and work than your normal cupcake, but trust me when I say, it’s soooo worth it. The cupcake portion, itself, is a graham cracker cupcake that is ridiculously moist and maintains that spicy graham cracker flavor that we all love. On top of the cupcake, is a thick layer of pumpkin ice cream, which is then covered in a cream cheese glaze. 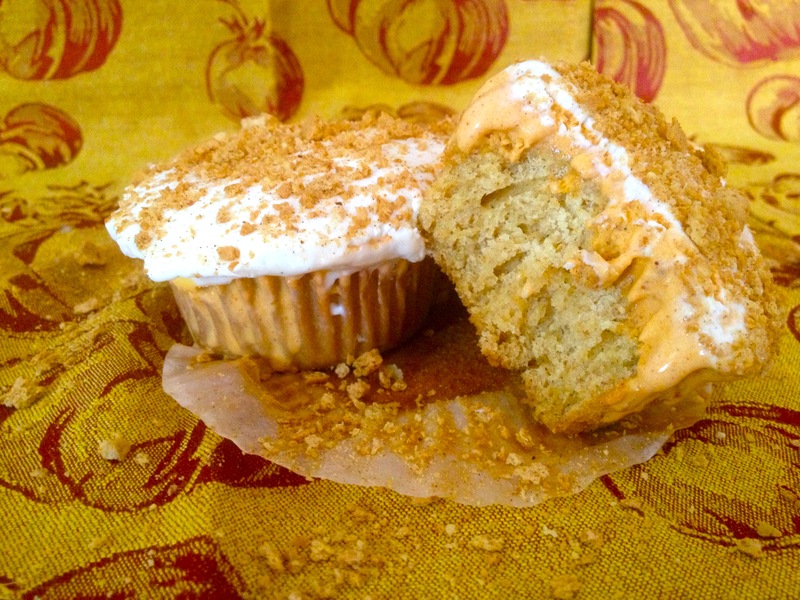 Finally, the cupcake is sprinkled generously with toasted pumpkin spice graham cracker crumbs. These cupcakes are a little messier than most (blame the delicious pumpkin ice cream), but I don’t think you’ll mind the sticky fingers after your first bite! NOTE: I had extra crumb topping at the end, so maybe try using 3 sheets of graham crackers instead of 5 and add pumpkin spice based off of taste. Cream butter in stand mixer until smooth. Add sugar and beat until light and fluffy. Add eggs, one at a time, beating until each egg is incorporated. In a small bowl, sift together flour, baking powder, baking soda, and salt. Mix in the graham cracker crumbs. Alternate between adding the flour mixture and milk to the wet ingredients. Mix until just combined. Scoop 2 tablespoons of batter into each cupcake tin. Bake for 14-15 minutes or until toothpick comes out clean. Let cupcakes cool completely or put them in the freezer to speed up the process. If you removed the cupcakes from the cupcake pan for cooling, return cupcakes to the pan once completely cooled. Carefully and quickly spread a spoonful of pumpkin ice cream on top of the cupcakes—make sure to cover the whole cupcake and leave a little mound on the top of the cupcake so they aren’t flat. If the ice cream becomes too soft to work with, return cupcakes and ice cream to the freezer until you can work again. Freeze cupcakes for about 1-2 hours or until ice cream layer is frozen enough (I let mine sit over night). Before making your cream cheese glaze, preheat oven to 350 degrees. Line a cookie sheet with foil and set aside. 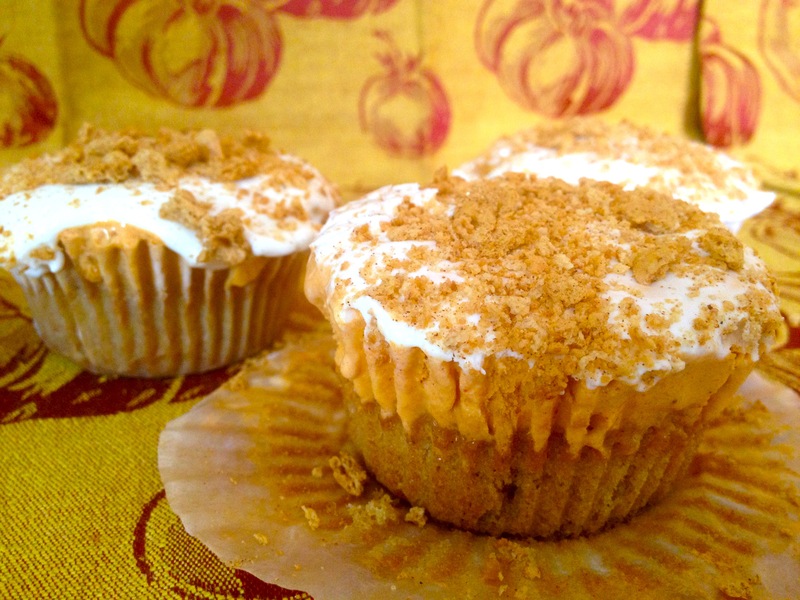 Combine graham cracker crumbs and pumpkin spice. Mix until well-combined. Pour crumbs onto foiled cookie sheet and bake for 3-5 minutes or until golden brown—watch the crumbs carefully because they can quickly become burnt. Once the ice cream layer has been set and the crumbs have been toasted make your glaze. In a stand mixer, beat cream cheese and powdered sugar until smooth. Add milk and vanilla. Mix until combined. Remove cupcakes from freezer and pour a heaping spoonful of cream cheese glaze over each cupcake—make sure to cover the whole thing. Once the cupcakes have been glazed, sprinkle the toasted crumbs over the cupcake.